Has Buffy Season 8 jumped the shark? When I started reading the Buffy Season 8 and Angel Season 6 comics I was happy that these shows were able to continue. Buffy and Angel had some of the best storylines and characters to ever grace television screens. In addition to great storylines and characters the show was also remarkably deep for what it was, allowing for detailed analysis’s for a long time to come. Buffy started out with interesting storylines and good looking art that actually resembled the characters. Angel started out with a storyline that was much harder to accept, and art that in no way resembled the characters. Things have improved since then with both comics being entertaining after settling in to the new medium. One odd thing in the Angel comic was the reappearance of Kate as suave and confident demonic crime fighter. Strange, but OK.
For the last few months however Buffy seemed to be bringing back as many characters as they could, just because they could. Likewise, while I understand there are almost no constraints on the story due to the freedom of the medium they seem to be taking liberties with the story just because they can. This isn’t always a bad thing, but having the entire US military attacking the Scooby gang seems unrealistic in that it never would have happened on the show. This is true for Angel also, with the Angel story-arc having the whole of Los Angeles turned into Hell – literally. The Angel and Buffy shows were always set in the same universe, and while the plots were self contained it was evident that big events were shared between them. If Angel had been renewed for a sixth season the fifth season finale would have been explained in a way that still allowed for the majority of people to remain unaware of the existence of the supernatural. With the storylines the comics have taken that becomes harder and harder to accept. The most recent Angel arc was interesting in that an Angel was introduced. This is the first time Christian mythology was acknowledged which was interesting, but not unbelievable. 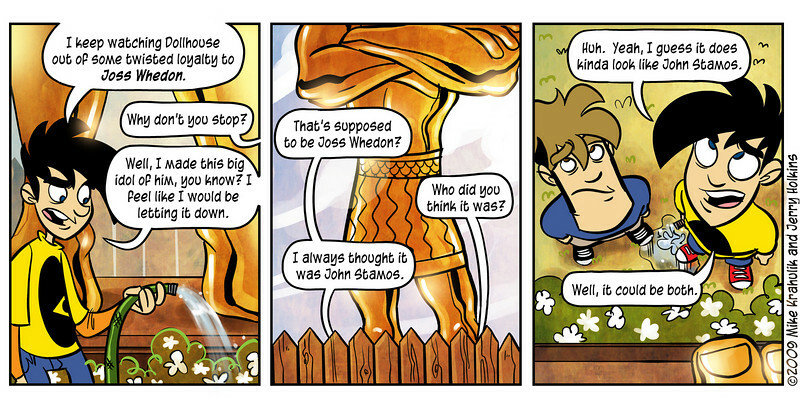 The most recent Buffy comic however….oh boy. The villain Twilight, how has been the main antagonist almost since the start of the series was revealed to be none other than Angel all along. O….kay. The thing is, Angel has had his own comic with his own storylines for a while now. Ignoring any obvious criticisms of making Angel the villain, how do you reconcile the fact that he has apparently been in two places at once for almost two years? It probably isn’t that rare that fans of one character are also going to be fans of the over, and read both. Is some huge, hard to swallow reveal and crossover planned? Angel did mention he had been in LA….maybe the time scale is different? Perhaps the Angel comics have been set over a few months, and Buffy years? When Angel Season 6 started it was set a lot closer to when season 5 ended, while Buffy seemed quite a bit in the future, so it isn’t that much of a stress. But then again, why take this approach if many people read both comics? Is this the moment where the Buffy comic has jumped the shark? It is too early to tell, and will depend a lot on what they do from this point forward to make everything make sense. I’ve enjoyed the comic thus far and I am hopeful that the storyline will be intelligent. I have very little faith, and expect ridiculous storylines that never would have been accepted if they were on the show. A good story is a good story regardless of the medium, not because it caters to it. Buffy Season 8 and Angel Season 6 have been stretched over almost two years. Maybe it’s time to have a season finale and move on to the next chapter of these characters lives.